CaulynDarr and I did another test game today. We tried out the Exfiltration mission last week, and found that it worked really well. So this time we decided to try the 'No Man's Land' mission. Here's how it went. 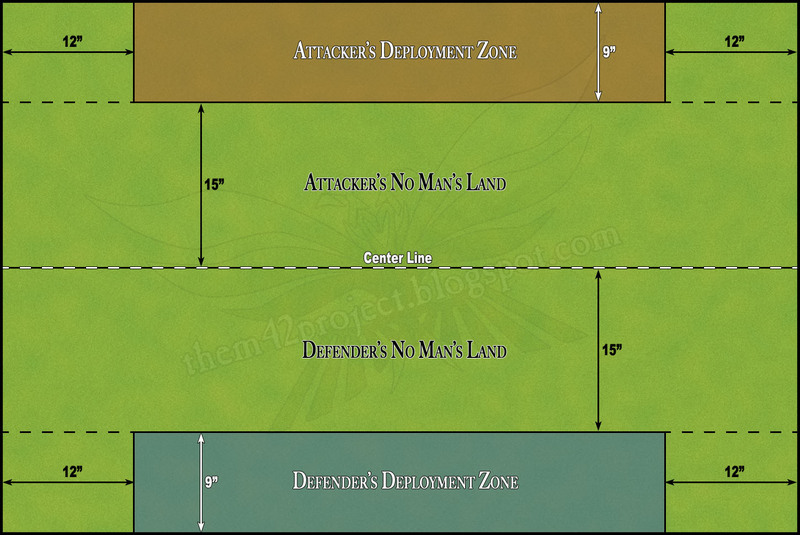 'No Man's Land', if you remember, is where both armies are dug-in with half of their forces and a bunch of player-placed obstacles between the lines. 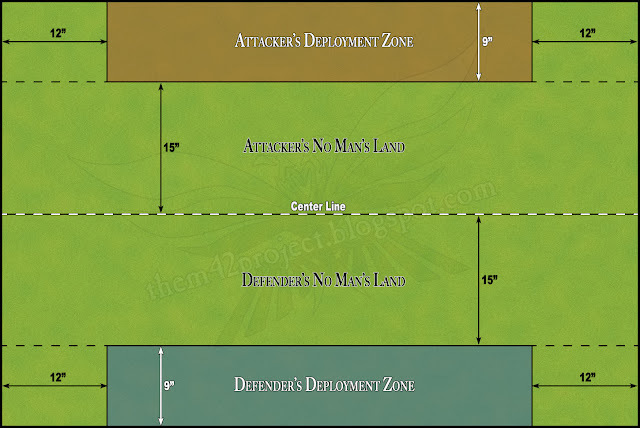 Basically, you both set up defensively, and then you roll to see who the attacker is. The attacker then deploys the rest of his force and the defender has to hold out until his reserves arrive. Over the top men! 1 LaansKnight Paladin with a Gatling Cannon and Storm Gauntlet. I toned down the durability of the Dragoons a bit by making them To 0, and upped their rate of fire to 3. I also gave the Laansguard an armor value (Ar2), which we used instead of the Evasion 'dodge' save. It just worked better to do it that way. Each model was measured and moved individually. To compensate for the loss of the natural bunching-up of moving At The Double, which used to make you vulnerable to flanking fire, we instituted a -1 Ev penalty for units moving ATD. It seemed to work fine. 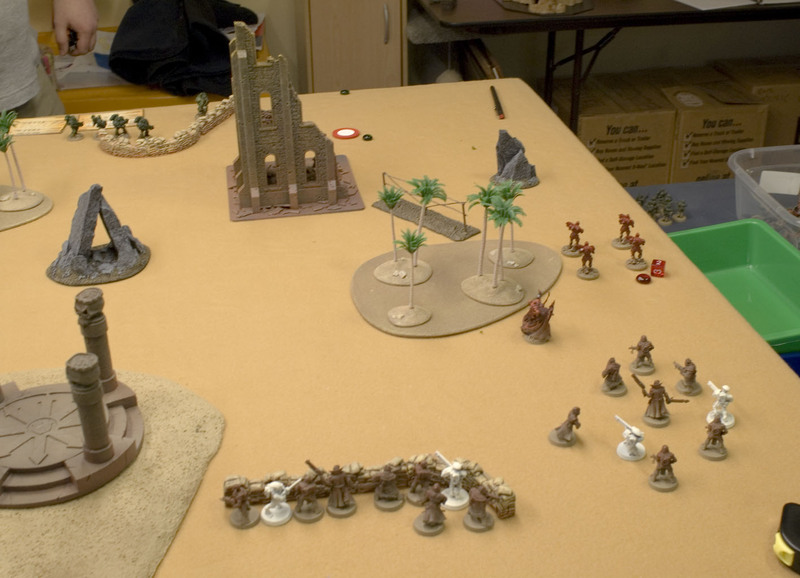 2) Fallback in Close Combat is now full movement for the unit falling back, while the consolidation distance for the other player is now 1/2 movement, rounded down. 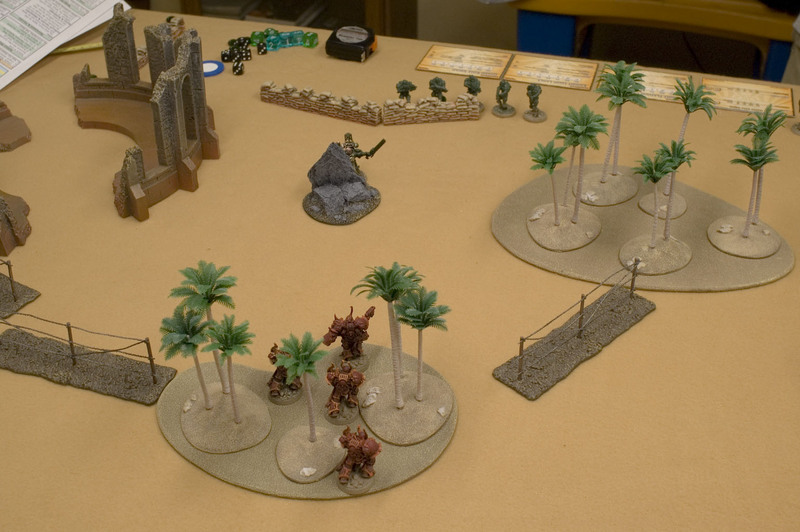 This was to ensure that a unit could eventually get away within a close combat round or two instead of being chased all the way across the table like last time. This worked well too. We decided to try out the Rapid Fire idea by letting eligible units pay 1 suppression to double their RoF. This worked really well and we liked the interaction of it. We set up, and then rolled off. Wherein I became the attacker. So I deployed the rest of my forces on the right and went for a flanking attack. 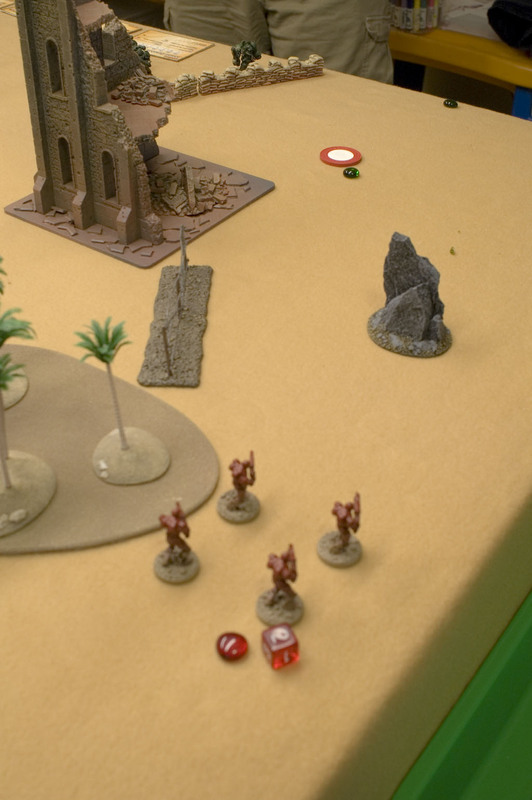 My LaansGuard destroyed the barbed wire that was just to the right of those trees with some Grenades (Wire is Ev0, To3), and my Dragoons ran right through the gap towards Darr's objective. Unfortunately, Darr's Paladin was there. 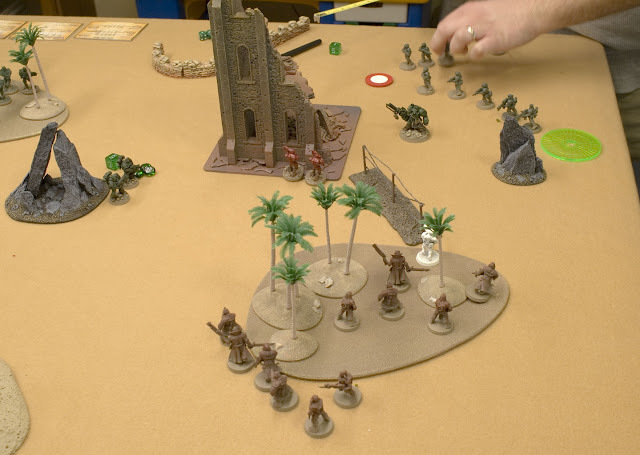 He moved up, and sniped out my leader, which was the only model he could see past the edge of the Ruin's base (which blocks LOS just like woods). 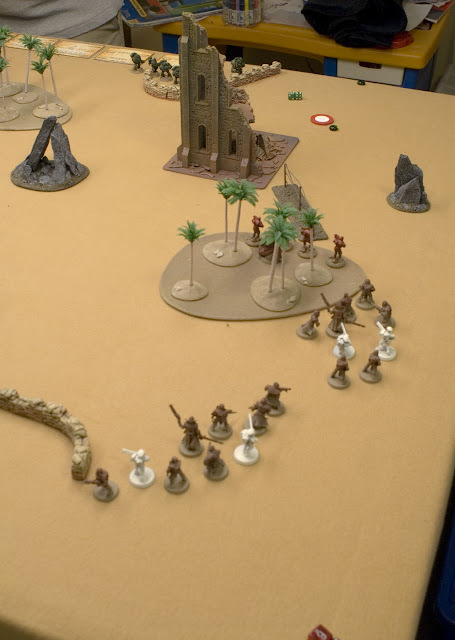 I moved the Legio squad up the middle to put pressure on Darr's Lieutenant and his own unit of Dragoons. His Lt. decided to come out and play. 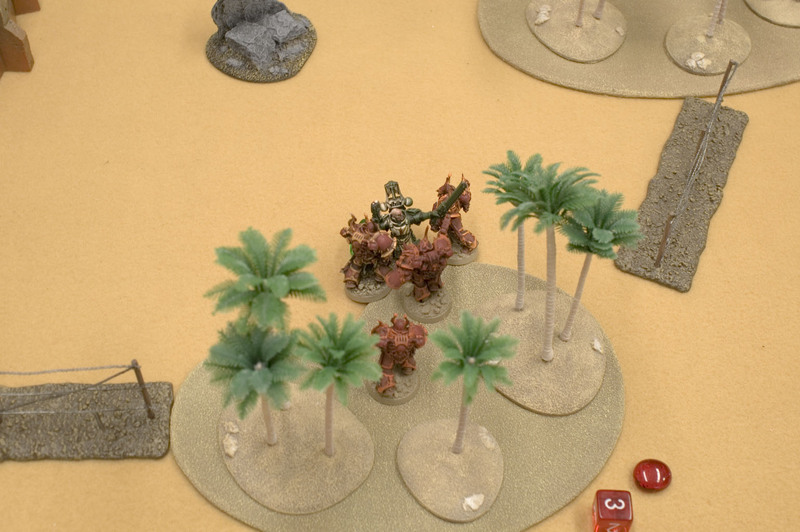 My Dragoons duck into the woods, while the Guard move up. The white models are the grenade launcher proxies. My Paladin puts some shots into Darr's Lt., but fails to even suppress him. You can see that I'm suppressing the hell out of those Legios in the middle. But I only actually kill one. Up to this point, the game is really fun. Without the distraction of flanking and bubble movement, we're getting into the game more, which is great. The Unit Reference cards are doing their job well, making it easy for us to keep track of everything. It's a full-on fire-fight over on the right. 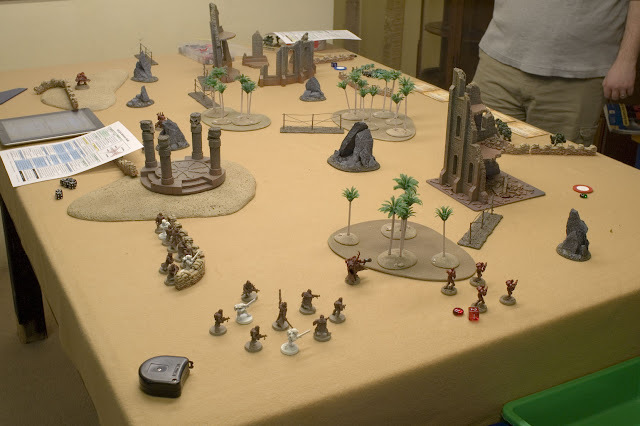 This is where we started running into problems as the game bogged down into a pointless shooting match that wasn't progressing anywhere for 3 turns. Eventually we just called it and started discussing the problems. The biggest problem that we had was that suppression wasn't doing much of anything when a unit had only 1 or 2 markers. Because any successful order just cleared them away. While if a unit had 3-4, the suppression was a little too effective. The units just weren't clearing the markers fast enough. 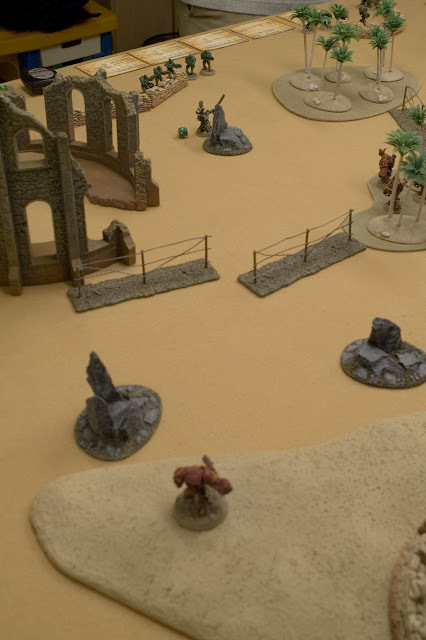 But the most irritating thing for me was that I was pounding on that middle Legio squad, giving them marker after marker, and they just sat there. They couldn't fire back and do much to me, but I wasn't doing anything to them either. They really needed to be forced backward once I'd maxed out their markers. If they were forced to consolidate 1/2 Mv every time they received another marker beyond the maximum, it would have been fine. That way my weight of fire, while not killing them, would at least have a tangible effect on them in some way. So expect a re-balancing of suppression this week as I address this. Other than the imbalanced suppression, the mechanics worked pretty well. We still kept forgetting to roll for lucky hits after the to-hit rolls (for attacker-allocation of wounds). 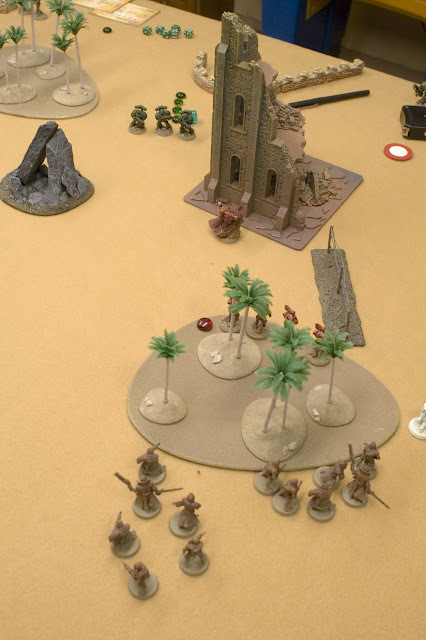 Moving those rolls to after the armor saves helped us remember, but then it caused problems with the wound allocation when models were standing behind a wall (+1 toughness), while others from the same unit weren't. We talked about maybe making the lucky roll a single die that you'd roll after attacks. So that it's always just one die. I'll think on it some more. We also talked about limiting the Task Force Commander's ability to add his leadership to units. Basically saying that he can only help 1 unit per turn. That would work for me. The mission also worked pretty much as we expected. Placing the terrain was cool, and not knowing who the attacker would be added some nice suspense. The only thing that might need some tweaking is the number of point obstacles you place during setup and the exact timing of the reserves. But I'm pretty happy with how those worked out in this game.